I'm not really one for designer clothing, cotoure and all that. I don't mind looking at it, but I know I'm never going to own it so I don't lust after it (too much!) 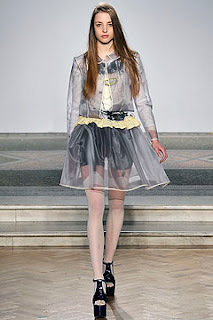 I make an exception when it comes to Luella because her stuff is just beautiful. This year, I half heartedly followed the shows on style.com but there were only three that stood out for me. I loved the mouth watering colours, the cute dresses, the pearl strap bags! Beautiful, and I can see myself in Topshop's versions of them already! I haven't seen much written about this collection which surprised me as I thought it was great. Style.com could see a 'Bananarama' influence and so can I! I love 80s fashions so naturally I was going to love this. This dress is my favourite, I can imagine wearing it when I go to Florence next year (fingers crossed). The print is young and cool and the cut is summery. Love it. 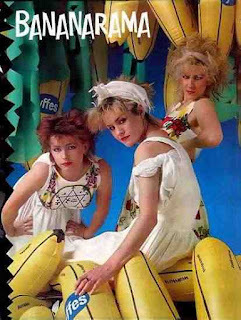 Oh and here's Bananarama for you!! Who? I hear you cry. Well that's what I was asking, but everyone seems to have fallen in love with this collection. It's gorgeous, pretty geek-chic. 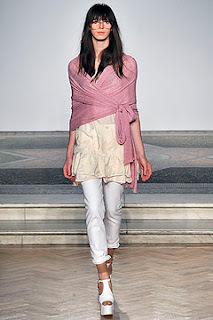 I'm definitely going to be getting some white linen trousers to knot above my ankle! I remember Bananarama that Venus song right?! For that alone, I'll do another 'Barbie post'...heehee! it was a great season !!! I love the Luella things too, and have for a little while... same here though, I doubt I'll ever own these designers' wares! I have my winter clothes pretty much wrapped up but they are there nevertheless. I did a bit of shopping and got the whole winter bit out of the way...although where I am....winter hasn't quite gotten here yet. Still I was admiring the boots. I do think I need a few pair to to be stylish in.